In this new series I'll be answering questions that I recieve on the comments, on twitter or by email. Today's question is "Where does synthetic oil come from?" by Aaron via email. Let's dive right into the topic! How to know the origin: The base oil. You've seen in on the oil aisles at wallmart, at your local petrol station or at any garage with loads of oil cans. Some say "Mineral Oil" or Conventional oil, some say "Semi-Synthetic" and others say "Full Synthetic" and this is a very important classification when it comes to the origin of each oil. Any motor or transmission oil, has a base oil, commonly known as stock oil. Base oil from from the groups I, II and III are mineral oils, which are refined straight from crude oil. Therefore, they come from "Dyno Oil". There is a lot of Synthetic oils that use group III base stock, so make sure that you check the label and online reviews of any ﻿﻿synthetic motor oil that you buy to know exactly where that synthetic oil comes from. Now we dive into full synthetic motor oils, which are the ones that use either group IV or group V base oils. Let's see it one by one. Poly-alpha-olefin (or poly-α-olefin, abbreviated as PAO) is a polymer made by polymerizing an alpha-olefin. They are designated at API Group IV and are a 100% synthetic chemical compound. It is a specific type of olefin (organic) that is used as a base stock in the production of some synthetic lubricants. When you see that a synthetic oil uses group IV base stock, it essentially means they made up their own synthetic recipe for that oil. Now there's other kind of full synthetic oils, and those are the ones that use group V base stock. Let's bring some Wiki wisdom here. Group V base oils are defined by API as any other type of oil other than mineral oils or PAO lubricants. Esters are the most famous synthetics in Group V, which are 100% Synthetic chemical compounds consisting of a carbonyl adjacent to an ether linkage. They are derived by reacting an oxoacid with a hydroxyl compound such as an alcohol or phenol. Esters are usually derived from an inorganic acid or organic acid in which at least one -OH (hydroxyl) group is replaced by an -O-alkyl (alkoxy) group, most commonly from carboxylic acids and alcohols. That is to say, esters are formed by condensing an acid with an alcohol. ​So, essentially, Group V stocks are also 100% man-made on laboratories... but then, what happens with that other synthetic oil? I'm talking about Pennzoil's Ultra Platinum series, which stands as a Full Synthetic motor oil. The same label reveals it "Made from Natural Gas"
So, where does natural gas come from? It is formed when layers of decomposing plant and animal matter are exposed to intense heat and pressure under the surface of the Earth over millions of years. So, unsurprisingly, Full Synthetic oils that are made using Natural Gas as a base stock, come from dinosaurs too. The main difference is that they do not use petroleoum (oil) as stock. 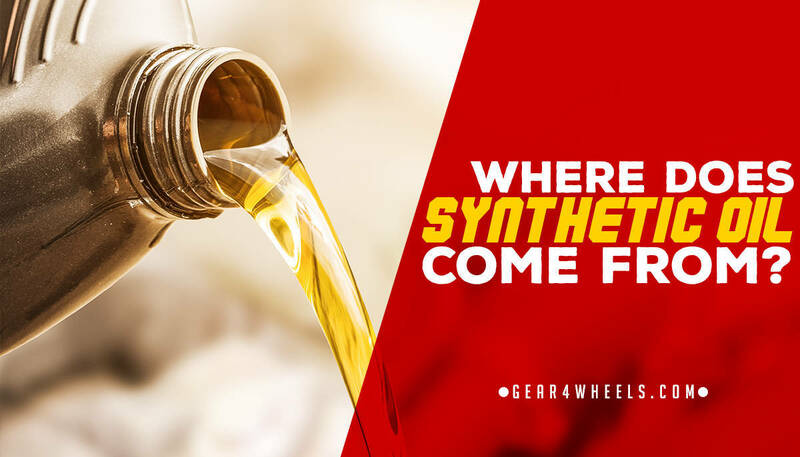 As a final conclusion and wrap up to this topic, here's the answer to the question "where does synthetic oil come from?" Synthetic oils that use Group I, II and III base oils, come from petroleoum crude. Synthetic Oils that use Group IV and esters from Group V, are 100% man made on laboratories. Synthetic Oils that use Natural Gas (considered a Group V stock) as base stock, come from natural hydrocarbons.